The Rustics have compltely revised their original selfpublished book that was first printed in 1997. 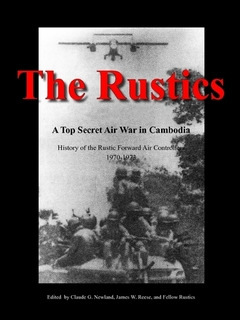 The completely revised Rustic book, The Rustics A Top Secret Air War in Cambodia is now available on www.lulu.com for $34.99, plus shipping, for the 488 page hardbound coffee-table size book and $8.99 for an electronic download version. The book is listed as The Rustics. It cost no more to ship two books than one, so consider buying an extra copy as a gift for a family member or friend. It's a priceless keepsake. The new book has 233 more pages than the original book, lots of additional photos, over 85 new Rustic stories, and a lot of new in nformation that makes this book the most complete Rustic Story ever told. This book fills in some of the gaps that were in the original book. Once ordered, it takes about 10 days to get the book. The Rustics-A Top Secret Air War in Cambodia is the complete history of the Rustic Forward Air Controllers (1970-1973) and their fight to save Cambodia from the communist NVA and Khmere Rouge insurgents during the Southeast Asia war. Their very existence was a closely held secret during the initial phases of their work, and by the time hostilities werre terminated on August 15, 1973, they had flown countless mission hours, controlled thousands of aerial bombardments of the enemy’s forces, endured major threats to their safety, and were hailed as saviors by loyal Cambodian forces. Some died in battle and many of those who survived have included their personal accounts in the book.